Hola Lola: Is it possible to do this without prescribed drugs (or unprescribed for that matter)???? Is it possible to do this without prescribed drugs (or unprescribed for that matter)???? 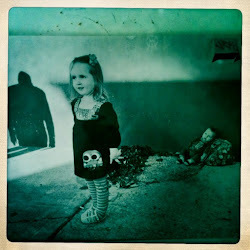 I do sometimes ask myself this question....Is it possible to do this parenting thing without taking prescribed drugs? Yes, it is possible. HOWEVER, there have been times when I feel like calling 911 and telling them to bring over an emergency bottle of any sort of anti-anxiety medication. I'm assuming all mom's face these moments....right?!?!?! 2) Around the same time Lo got a stomach bug. She woke up Friday around 12:00 a.m. and threw up all over me....exorcist style throw up. It was horrible! She proceeded to throw up throughout the night. We completed three change of sheets/clothes and the entire room reeked of throw up. This sickness continued through the weekend. It eventually turned into horrible diarrhea that turned into a horrible diaper rash...poor baby girl.... I felt so bad for her. 3) Lola wouldn't take a nap that entire weekend. Keep in mind Clay was working all weekend so that translated into 24 hr single mom who was fatigued due to lack of sleep and whose nerves were in pain. 4) Toddler fits!!! Hmmmm...I don't know what else to say other than they were out of control inconsolable toddler fits that happened throughout the day and night. Luckily, they seem to come in phases. If Lola is halfway functioning during these fits she'll back talk me. ALREADY!!! My goodness what am I in for?!?!?!? She'll say things like "Don't say No!" with a sharp stern tone. Or "Don't sit that way!". Or "Move you arm!". Mind you "my arm" is no where near her. 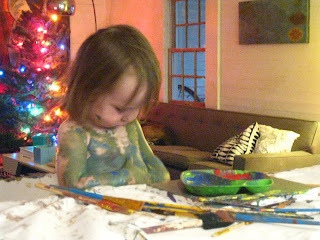 She's only being Ornery which can be very disconcerting at times. 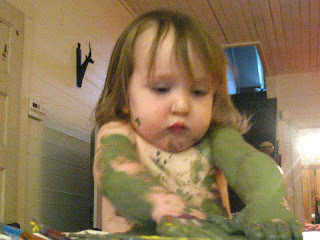 Is this only the terrible twos or is there more to this????? Seriously, there was one point where I didn't know what to do anymore. I finally threw my hands up and started crying myself. Lola looked at me and said "Don't cry like a baby". Ummm....no she didn't! I think she eventually felt bad about this comment b/c at one point she stopped throwing the fit. Yea, I'm thinking it's bad when your not quite 2 yr old is telling you not to cry...uh huh! What are you going to do?!?!?! Of course, I have to say, it worked! It made her stop throwing the toddler fit. So, for all you mothers out there who have a soon to be toddler, mark this one down as a reference....this is a big tip to remember. 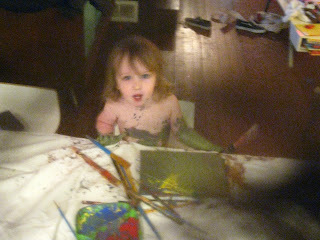 On a good note, painting is one of Lola's favorite things to do. 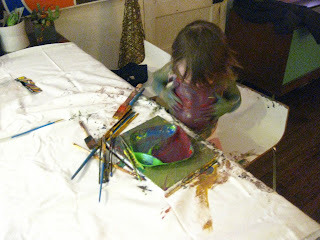 I've attached some fun pics from one of Lola's messy paint sessions. I have to talk to you about painting. I need to pull the trigger but am having a hard time. these photos are great. we also need to get the both of these 2 year olds together. we can show you how to enjoy eating your boogers and how to talk in a crazy deep growl satan voice. the answer to your original question, I believe, is no. but I am down with that. :) Hang in there. Kristin, I so feel for you. I actually said this very thing to Clay last weekend. I know Troy works as much if not more than Clay....plus, you don't have the luxury of stepping away to work for a good 8 hrs a day 5 days a week. My quote to Clay was "She must be much more patient than me". He said "Well, that's a given!". BTW...I'm stealing some ideas of yours off your blog...will tell you about them later. Talk soon!